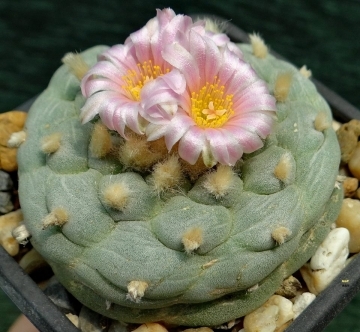 Again a very beautiful variety with large striking pink blooms from the notorious Lophophora family. Origin and Habitat: This species has a very limited range around the lagoon near Viesca in the state of Coahuila, Northern Mexico. Habitat and Ecology: Lophophora fricii is found growing in two very different habitats, on plains with xerophyllous scrub, mesquite and agave, and on limestone slopes and mountain tops. The species is very abundant in appropriate habitat. Illegal collecting for producing ointments poses a threat to this species. 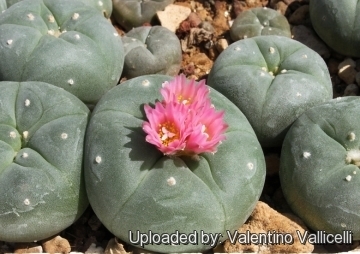 Description: Lophophora williamsii var. fricii is a geophytic, button-like, spineless cactus with large tap root, and only the apical part of the stem exposed at soil level. The stems are typically broad and flattened, and large clumps up to 40 cm wide can be produced over time by repeated lateral branching of the original stem and its branches. 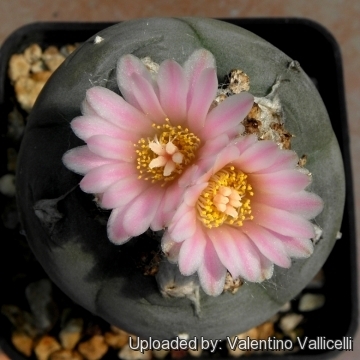 It is described as differing from Lophophora williamsii in having yellowish-grey-green epidermis, a different arrangement of ribs (usually lacking well defined ribs), and seeds with a coarse testa and a compressed V-shaped hilum. Typically the flowers are carmine-red, but as demonstrated by observing plants in habitat, the colour can be much lighter than that indicated in the description. Stem: Pale grey-green to yellow-green, usually lacking well defined ribs and furrows. The stems starts branching when a plant with a single crown reaches the size of a large saucer. Then branches (consisting of small crowns) begin to erupt from the areoles at the perimeter of the parent plant’s crown. When the new branches reach a certain size, they put down their own tap roots, making them independent of the parent plant that produced them, and then they begin to branch in turn. The result, which probably takes several decades to manifest itself and has no obvious endpoint, is a large clump of dozens of more or less connected plants, ranging in size from new branches that may be no more than a centimeter in diameter, to very large 21-ribbed plants that may exceed 10 cm across. Ribs: 5-13( occasionally up to 21) the podaria (tubercles) are rarely elevated, but are broad and flat. Areoles: With tufts of hairs that usually spread unequally on the prominent podaria. Flowers: Commonly pale to dark pink (or rarely pinkish white), reaching over 4 centimetres in diameter. Seeds. Oval , 1.5 mm long and 1.2 mm wide, with the hilum compressed into a V shape. The testa black, coarsely nodulated, with an oval tubercle structure and tubercles becoming smaller near the hilum. 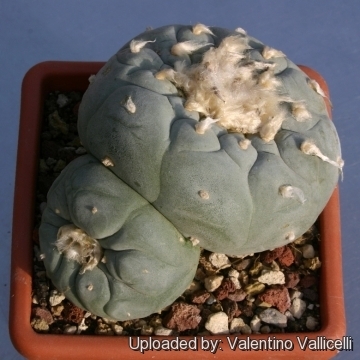 Remarks: In habitat Lophophora fricii is a very mutable species. It´s hardly to find two similar plants at one location. Particularly in terms of the bloom they are different at the same locations. 1) Terry, M. 2013. 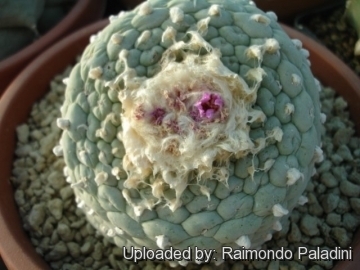 "Lophophora fricii." The IUCN Red List of Threatened Species. Version 2014.3. <www.iucnredlist.org>. Downloaded on 09 December 2014. 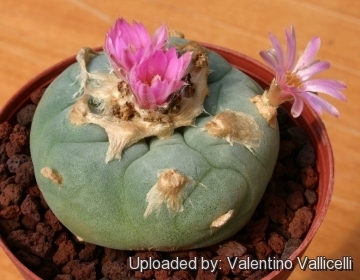 Cultivation and Propagation: Lophophora williamsii var. 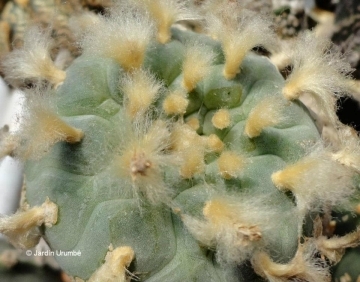 fricii is a slow growing cactus species. Soil: Because of the tap root they are very rot prone, so use highly gritty compost with much drainage. Exposure: Requires half shade to part sun. Watering: Watering should be rather infrequent to keep the plant compact and avoid it becoming excessively elongated and unnatural in appearance. Watering it properly is often difficult, because this plant tends to crack open or rot if over-watered. The fact that the plant retracts into the soil and assumes a grey-green colouring between watering, is perfectly natural, and doesn’t cause any damage. Overwintering: Keep completely dry and cool in winter (An unheated greenhouse would be perfect) or when night temperatures remain below 10° C, it can survive low temperatures (appr. -7°C) for a short period. Assure a good ventilation. Use and Trade: The species is used locally for treating sore muscles. It is very likely that the species is collected for the production of ointments at a large scale. 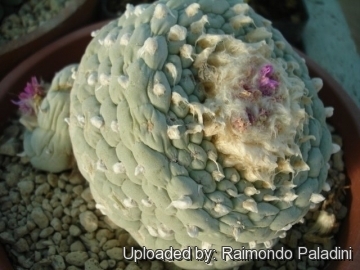 The species might seldom be collected for ingestion by mistake, as it does not have hallucinogenic properties such as Lophophora williansii. Propagation: Seeds. 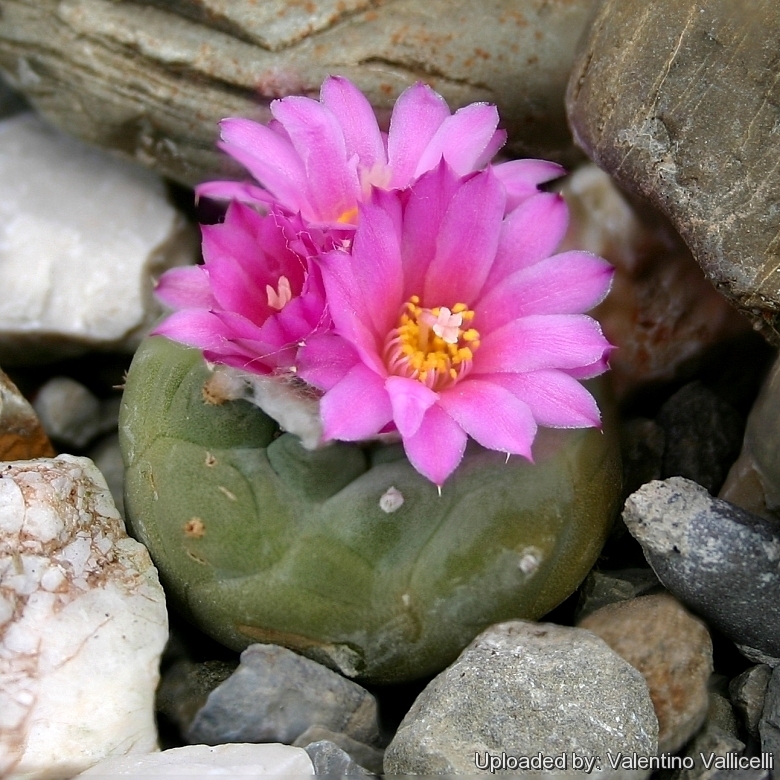 Seeds should be sown in spring in sterile cacti mix. Cover with a humidity dome or plastic wrap and leave in a warm spot in 50-75% shade. Fluctuating temperatures are best (ie. high day temperature and low night temperature) as they simulate the desert environment. Keep constantly humid as seedlings cannot survive if to dry. Seedlings will emerge in 7-21 days and can be grown in the same environment for a number of months. Mulch with thin layer of small quartz gravel (1-2mm diameter) this helps them stay upright, hinders algae growth and regulates moisture. As they get older the watering can become less frequent. Potting up can be done when 5-10 mm in diameter.